A run or running free is essentially sailing with the wind pushing the boat from behind. When you fall off from close-hauled to reaching, you ease the sails to maintain a consistent angle to the wind. As you fall off to a run, however, you reach a point when you can’t ease the sail out any farther because the boom is against the shrouds that hold up the mast. If you want to turn farther, you will have to jibe and bring the boom over to the other side of the boat. When the boom crosses the centerline of the boat-an imaginary line from the bow to the middle of the stern-you have changed tacks. Any change of tack from port to starboard or vice versa while sailing downwind is called a jibe. When sailing downwind, the bow turns away from the source of the wind and the wind comes over the stern. Just changing course downwind is not jibing. Until the boom crosses the centerline, you are simply falling off-turning away from the wind while staying on the same tack. 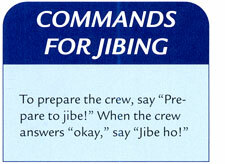 You will give your crew specific commands during a jibe. On the command, “Prepare to jibe,” the crew’s job is to start pulling in the mainsheet. lt is safer and easier to bring the boom toward the center of the boat as the person steering starts the jibe; this way, the boom has a shorter distance to travel when it swings across. When the wind starts to fill the back side of the mainsail, the boom will come across with fury-and woe to anyone who gets in its path. By trimming it in first, the crew keeps the swing of the boom to a minimum. When you see the boom near the middle of the boat, give the command, “Jibe ho!” and turn the boat. As soon as the boom crosses the boat’s centerline, the crew should let out the mainsheet quickly on the other side to keep the boat from heeling excessively. Don’t be alarmed if you start to turn the boat the wrong way in a jibe. New sailors often do this, but it can be corrected easily. The proper direction jibes the boat. The wrong direction causes the boat to round up on the same tack toward the wind. Just remember to turn the bow toward the end of the boom when jibing and you will be fine. Because of the distance the boom has to travel across the boat when jibing, a major concern is that the boom might swing across unexpectedly. This is called an accidental jibe, and it can happen when the skipper unintentionally veers off course or a wind shift occurs. 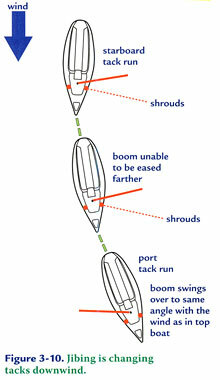 The wind ends up on the same side of the boat as the main boom and pushes the boom across. The process of jibing varies with different sailboats. Some sailors throw the boom over to the other side rather than trim it in. But until you know the capabilities of your boat, the safest way to jibe is the prudent way-as described above. A run is a “warm” point of sail, as the wind is from behind, going with you. 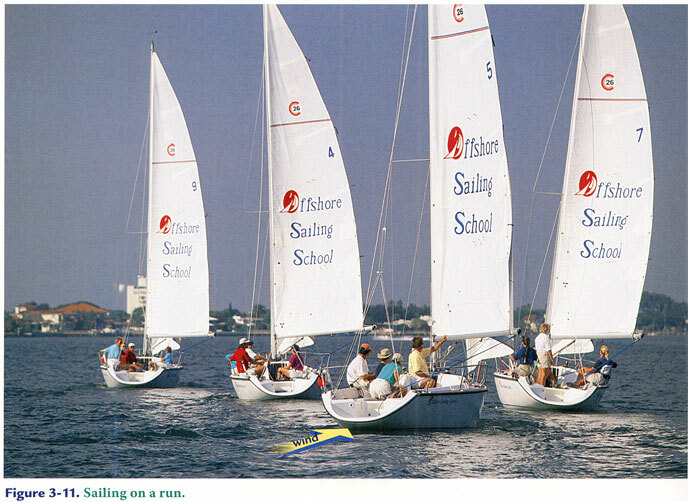 In Figure 3-11, all the boats are on a run, sailing downwind. The wind is coming from behind; the sails are all the way out. What tack are they on? When the wind gets on the wrong side of the sails on a boat like a Colgate 26, which has a main and jib, the jib starts to dance and an accidental jibe can occur. In Figure 3-12, Boat A is sailing with the wind on the opposite side of the boat from the boom, the jib is full, and there is no fear of an accidental jibe. Boat B is sailing dead (directly) downwind, and the jib is looking soft because the main is blocking the wind; but this boat is in no danger of jibing unless you steer sloppily or a wave throws the stern to one side. Boat C is sailing by the lee, with the wind on the same side of the boat as the boom. Though dangerous, a boat can sail along like this with the wind coming over the leeward side of the boat. You might think this would make it the windward side because the wind is now hitting that side first; to avoid confusion, right-of-way rules define the leeward side as the side over which the main boom is carried. Boat D has sailed too far by the lee. The wind will catch the other side of the mainsail and throw it across the boat in what is often called a flying, or accidental,jibe. The boom rises up in the air unless held down by a boom vang, and the wind fills the other side of the sail and causes an accidental jibe. Note that the jib is already crossing to the other side of the boat: this is your first warning of an accidental jibe. When the jib crosses to the other side, the main isn’t far behind-so watch out! To avoid this, head slightly higher. Boat E has jibed and is now on starboard tack. After jibing, you can steer any course on starboard tack all the way up to close-hauled just by hardening up. Try this often. It’s a great exercise in learning the feel of different points of sail. Sailing terms may seem confusing at first, but proper communication on a boat not only makes sailing more fun, it is an absolute necessity when swift action is required. 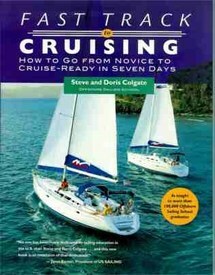 Editor’s Note: This tip is from Steve and Doris Colgate’s Fast Track to Sailing textbook, published by McGraw-Hill in 2009. Order your copy today!